Fatman by TL Audio announced the iTube ValveDock MkII iPod/iPhone-compatible amplifier dock is now available with or without speakers. The iTube ValveDock MkII builds on its award-winning Fatman forebear, but ups the original's power, plus adds a USB input. 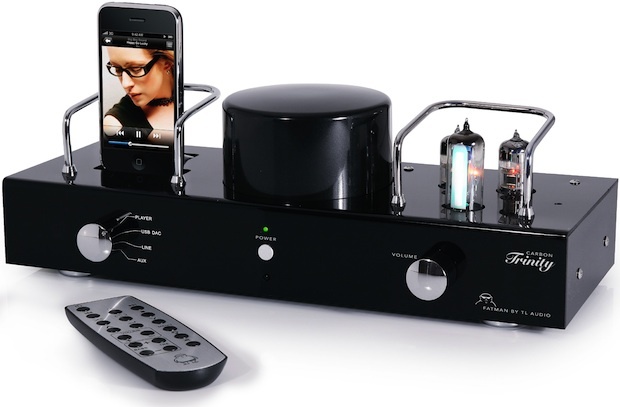 The two-piece design comprises the beautifully finished amplifier and matching iPod dock, and comes complete with all the necessary accessories — including high-quality speaker cables and a full-function remote control. Featuring a trio of carefully selected valves, the hybrid-tube amp lays out up to 2×25 watts of luscious sound and its line-level inputs mean it's a simple job to kook-up the likes of your CD player. The USB is a smart addition, meaning you can enjoy your computer-stored tunes through the superb sounding MkII Fatman. TL Audio began manufacturing professional audio valve products in 1993, almost single handedly kick-starting the valve revolution. Respected by producers, sound engineers, TL Audio valve units are used in studios the world over. From the outset its design philosophy has been to utilise the best qualities of both tube and solid state circuitry to produce a superb combination of sound and performance. And this mantra has been carried through to its range of Fatman hi-fi products. Launched in 2006 Fatman quickly established its reputation for producing some of the best performing audio systems for use with Apple's iPod, or indeed any portable or fixed media device. All iTube amplifiers have additional inputs for CD etc., making them fully comprehensive audio systems for all audio sources. But why valves? Well, as professional recording artists and producers discovered, digital with all its acknowledged advantages can sound a little cold and harsh, lacking in 'warmth'. That's where valves come in. Correctly and sympathetically inserted into the signal path, the presence of valves enhances signal quality. The skill in valve design is in knowing where to place the valves and how to combine them with state-of-the art solid state circuitry in order to achieve maximum sonic benefit. With over a decade's experience in professional audio, the people behind Fatman have this skill. And then some.